This summer we had an excellent crop of beetroot. Grown from seed and planted into a relatively new garden bed they quickly grew fat. I decided to pickle most of them as I didn’t want them to suddenly bolt in this extreme summer heat. I left some in the ground, stored some in the fridge and apart from the many we have already eaten roasted, grated or boiled I pickled and preserved 7 & 1/2 kilos. That translated into seven of the 1 litre old style agee jars. They are super delicious. I went through lots of different recipes and put together something that suited our tastes and preferences. 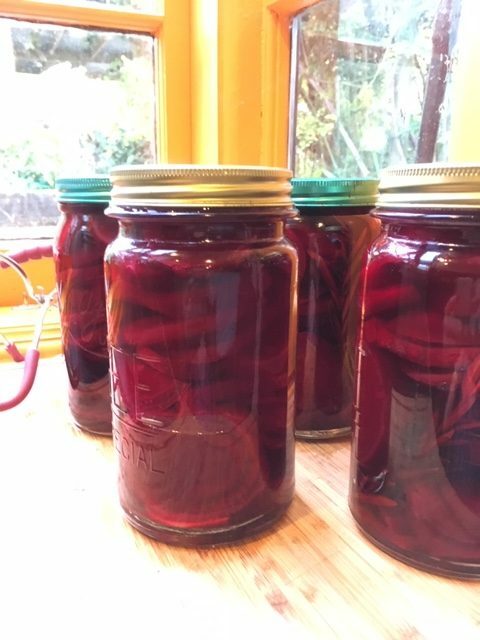 I added fresh ginger and rosemary to each jar and popped some pickling spice into the vinegar brine for about 5 minutes only as I didn’t want the spices to overpower the natural earthy taste of the beetroot. 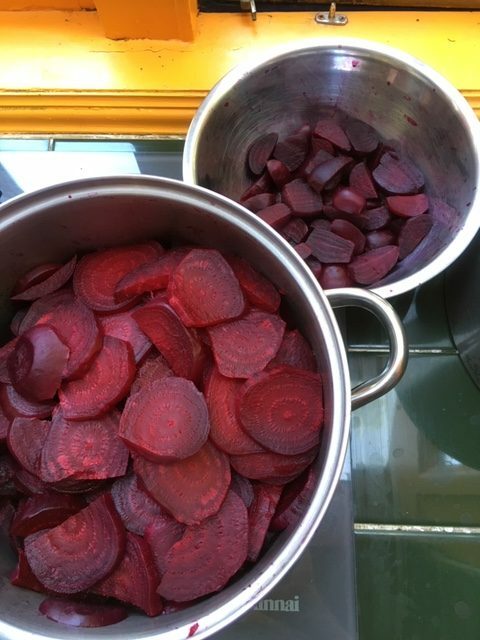 If you are processing less beetroots just scale down the recipe. Exact measurements are not that Important as long as you have at least a 2 vinegar to 1 water ratio. This is important to kill any bad bacteria. Most recipes use heaps of sugar but I didn’t here and it was definitely a perfectly good flavour. It’s always better to have an excess of vinegar brine that not to have enough. Store any extra in the fridge and use another time. Ingredients; 7 1/2 kgs beetroots, plain salt, 8 cups vinegar, (I used half cider half white) 4 cups water (one of these is the liquid the beets are cooked in), 1/2 cup fesh lemon juice, 2/3rds cup brown sugar, fresh ginger, fresh rosemary sprigs, whole pickling spice. Method; Prepare your jars. You can use classic agee jars and seals or pre-used jars with pop down lids. Wash jars and lids in hot soapy water. Dry with a clean tea towel and put to one side. Now wash your beetroot leaving at least 1 inch of stalk and the root intact. If you cut into the beetroot now it will bleed it’s wonderful colour out into the water. 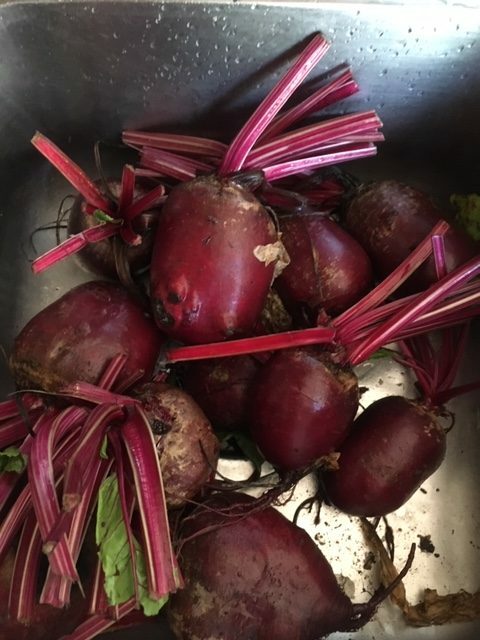 Because I had so many beets and roughly small, medium and large sized I divided them into 3 pots and cooked the sizes separately. Cover the beets with boiling salted water and cook until still firm. I wanted them to be al dente and not soft and squishy. It’s quite important not to overcook. The small ones cooked in no time while the massive ones took much longer. This way I could skin, trim and halve/quarter the smalls whilst the others were still cooking. The medium and larger beets were sliced. Make sure to keep aside some of the water for the brine. Its much easier to peel the beets while they are still hot. Place them into the sink, run them under a little cold water and you can slip the skin off easily. In the end I managed one jarful of the smaller halved beets. Remember they will get more cooking at the end in the water bath. Now the beets are ready and waiting so we can prepare the vinegar brine. 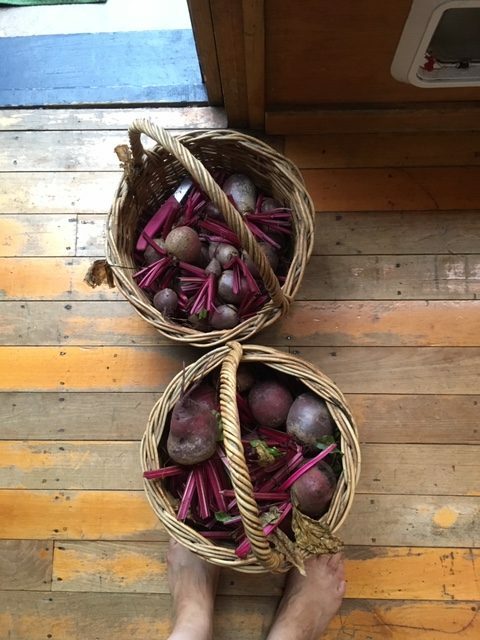 Time to fill the jars with the beets. Firstly put a rosemary sprig up against the inside of each jar and a few peeled slices of ginger at the base. Now pack your beets in pushing down and jiggling the jar gently to fill all the space. Leave about 1/2 inch head space clear at the top of the jar, making sure the rosemary is below the head space as well. Bring the vinegar brine back to a simmer then slowly pour into each jar again leaving 1/2 inch of head space. Use a clean cloth to wipe the top lip of the jar as any debris no matter how minuscule will prevent the seal from working. Place on the seal and a screw band. (or screw your pop down lids if this is what you are using) Tighten but not too tightly as the air needs to escape through the seal before it hermetically seals. fat beets and gardeners feet.